Beef tataki is one of the simplest and wowingly amazing dishes to make for parties. Just make sure you use really good quality eye fillet only. Clean the beef fillet by removing any sinews or fatty bits. Bring to room temperature. Line a hot frying pan with a little (only little) oil and seal all sides of the fillet. The texture outside should be quite crispy, but the fillet should be quite springy to touch. Place the fillet in a container with water and lots of ice to arrest cooking. Leave until the fillet has cooled. Remove and pat dry well and wrap in kitchen towels. 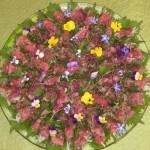 When ready to serve, slice into thin (about 2mm) slices and arrange on a plate or platter. Garnish with lots of shiso buds, micro buds, edible flowers or whatever takes your fancy (as we’ve done in the photo) and pour on your favourite dressing, such as Kei’s Kitchen Japudore (Japanese Style Dressing) available in our Online Deli.